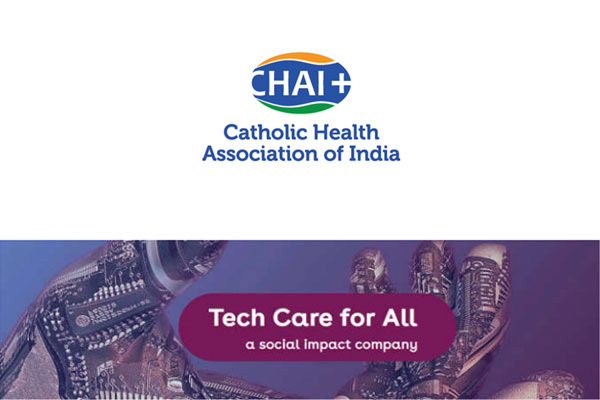 Tech Care for All and Catholic Health Association of India (CHAI) today signed a partnership agreement for Tech Care for All to support CHAI in its role as leading non-profit network of health centres and hospitals offering compassionate, affordable and high-quality healthcare. CHAI is a major Indian healthcare provider, second only to the government in reaching the underserved and people for whom primary healthcare would otherwise be out of reach. The organization is actively pursuing modes to modernize and optimize its operations to be more sustainable while upholding its commitment to serve those in need. Tech Care for All (TC4A), a global social impact company with India headquarters in Mumbai, has deep expertise in health technology and health service delivery, along with advisory prowess to help organizations successfully execute complex transformations. Through the partnership, Tech Care for All will assist CHAI to develop and pursue its Vision 2030, a ten-year plan by which CHAI is progressively building capacity and resilience in its network. For example, investing in digital recordkeeping, telemedicine and other proven technologies will help CHAI increase the efficiency and quality of care for communities. Along with providing primary and preventive care, CHAI offers expertise in delivering palliative care, as well as in holistically supporting people with disabilities—two areas where India’s healthcare resources are considered inadequate. Under the partnership, CHAI and its member institutes will build and share new knowledge in palliative and disability care while increasing advocacy efforts with government to meet the pressing needs. Member institutes include (among others) Catholic health facilities, training institutions and social service societies. Other aims being pursued include centralizing procurement, gathering more data on patient outcomes and offering greater professional development opportunities for member institutes. “Transformation is essential in order to continue CHAI’s role as leader in sustainable and compassionate healthcare,” explained Father Mathew Abraham, CHAI’s Director General, adding that 80 percent of the nearly 3700 CHAI health facilities serve India’s remote areas. Catholic Health Association of India (CHAI) is a 75 year-old healthcare NGO and network of health facilities serving 21 million people annually. It is staffed by 51,000 health professionals including more than 1000 Catholic Sister-Doctors who have dedicated themselves to health ministry, reaching the poor and marginalized. The CHAI Directorate in Secunderabad leads initiatives in thematic areas such as community health, holistic programs for children and youth with disabilities, and palliative care, among others.